The EUROCOM Shark 4 is setting new user upgradeability standards. Upgradeability is a core tenet of all Eurocom systems; the Shark 4 is no different with upgradeable memory, storage, display, wireless card and keyboard. “For users to upgrade their own EUROCOM Shark 4 all they need is to simply pop off the bottom with a few quick screws to access to the entire computer from memory to storage, wireless cards and M.2 4G/LTE modules and to remove and replace the keyboard, even they display panel is easily upgradeable. We believe our customers should be in control of their laptop. It is a Personal Computer (PC) after all.” Mark Bialic, Eurocom President. The EUROCOM Shark 4 supports two upgradeable memory modules for up to 16 GB of DDR3-1600 memory. The two SODIMM are easily accessible and upgradeable. Memory is scalable, from 2 GB up to 16 GB. The EUROCOM Shark 4 can support three storage devices, including an M.2 SSD SATA PCIe Gen2 x2/x4, one 9.5 mm HDD/SSD SATA and another 7mm storage drive through a storage drive bracket installed in the place of the optical drive, for up to 2.512 TB of storage. All three storage drives are easily accessible and upgradeable for users to continually customize their system or if, unfortunately, a storage drive fails, to replace it. 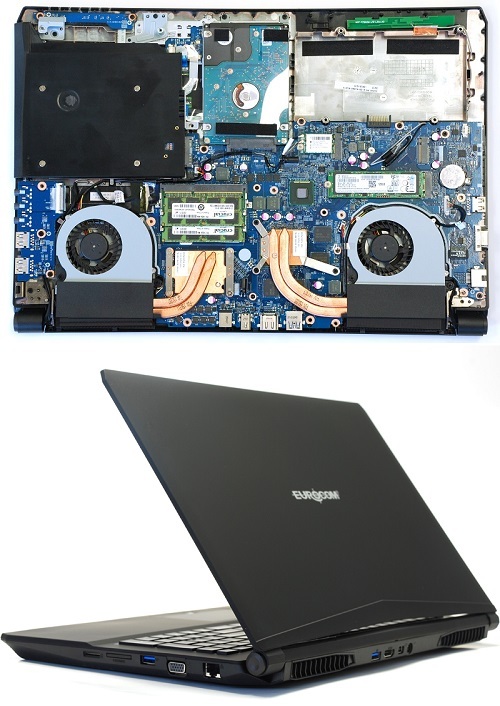 The EUROCOM Shark 4 is one of the few new laptops with an optical drive – we recognized this need for many customers so we listened by offering the Shark 4 with an upgradeable optical drive that can be a DVD drive, Blu-Ray drive or an additional storage drive bay. The Shark 4 is prewired for an upgradeable 4G LTE or UMTS/HSPA+ M.2 3042 card module support, through an M.2 slot, so users can easily add an M.2 internet module with a SIM card to have a reliable internet connection on the go. The EUROOCM Shark 4 supports WLAN Combo M.2 2230 Card with PCIe and USB interface cards, which is easily upgradeable while also being very powerful. The EUROCOM Shark 4 comes with a high quality white backlit keyboard with three brightness settings that can be easily changed through a keyboard hot key, for easy typing in the dark. X-structure key technology is utilized for a great typing experience. During the purchase and customization process customers can choose between a variety of keyboard languages including: English USA, English UK, Spanish, French, Italian, Norwegian, Portuguese, Swedish and Swiss German. Users can choose between Windows 7 or 8 and various Linux distributions. The EUROCOM Shark 4 comes with a Trusted Platform Module 2.0 for user configurable, rock solid security capability to keep your data safe at your own discretion. A Kensington lock port and fingerprint reader round out the security trifecta. The EUROCOM Shark4 comes with a choice of two 15.6” full HD 1920x1080 displays, users can choose between matte or glossy. To keep the EUROCOM Shark 4 sleek, lightweight and fast the system has been fitted with NVIDIA GeForce GTX 960M graphics and Intel Core i7-4720HQ processor. This combination of graphics and processing capability combined with the Shark’s upgradeable nature to create quite the impressive laptop that brings together a perfect mix of capability and user freedom.